Wednesday through Saturday, noon to 3 p.m. and 5 to 9 p.m.; Friday and Saturday, noon to 3 p.m. and 5 to 10 p.m.; Sunday, 10:30 a.m. to 3 p.m. and 5 to 9 p.m.
A recent lunch special at Stonecat Cafe: Bone-in braised duck leg served with sautéed kale and a savory sage biscuit (left). 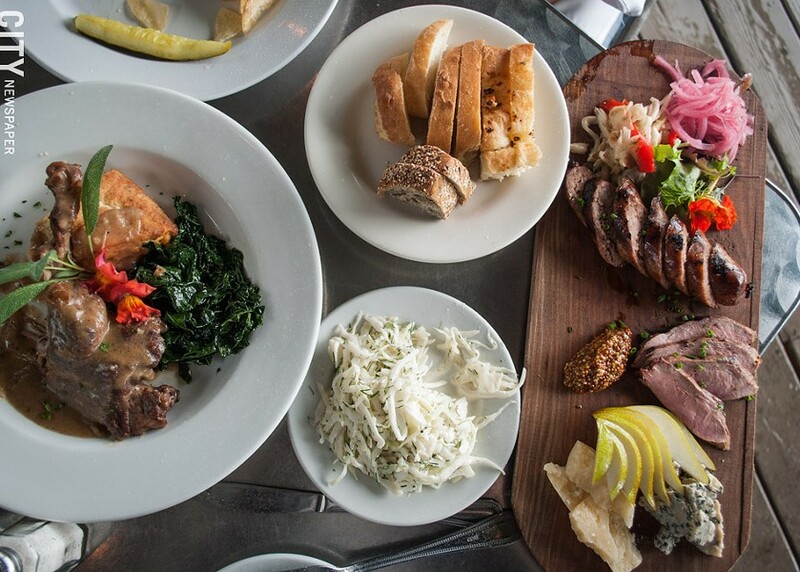 Also pictured: house-made bread, cole slaw, and charcuterie board. It finally feels like October in Western New York. 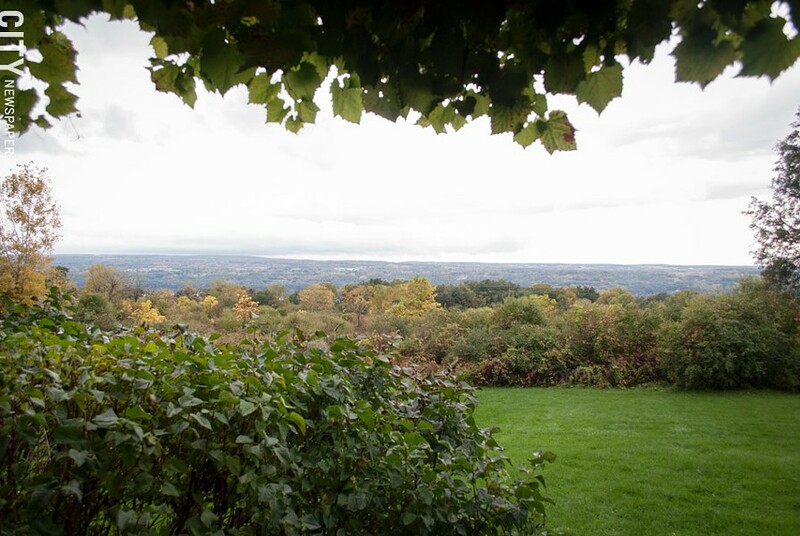 During harvest season, locals delight in fresh grapes, apples and pears, and pumpkins — and along with that, the fleeting beauty of the foliage in the Finger Lakes. The geological history of the formation of the lakes is special to our region. Mile-high glaciers once sculpted the hills, lakes, and gorges that visitors travel from all over the country to see. Seneca Lake's wine region is particularly special because of its size, its depth (the deepest of the lakes) and the number of wineries that border it. Nestled between willow trees on the east side of Seneca Lake, the restaurant's outdoor patio is a serene spot to watch the sun set (and for timing an approaching rainstorm before it baptizes a patio meal). For day-trippers, Stonecat is also great place to stop for lunch. The lunch menu features sausage corndogs and smoked tofu salad, and each item on the menu is paired with a suggested wine. Guests should be sure to try house favorites like the comforting Russet potato poutine made with chicken and duck stock. However it would be wise to ask about the specials: Stonecat recently featured a tender bone-in braised duck leg served with sautéed kale (and a side of the creamy potato sauerkraut gratin is a hearty pairing). The duck was accented with a savory sage biscuit made by pastry chef Daphne Nolder. (Be sure to leave room for dessert, especially if Nolder's house-made pear sorbet is on the menu). A flight of house-made sorbets (flights are not on the menu, but a rotation of sorbets are offered individually). The question at hand is when to go to Stonecat. Thursday through Sunday nights offer more upscale service, and yet maintain the spot's comfortable atmosphere. Wednesday night after 5 p.m. is pub night, when guests have access to the bar menu anywhere in the restaurant and can enjoy live folksy music. That's the night to get burgers and poutine. The joint also hosts live jazz during Sunday brunch. "This place has so many faces," owner Scott Signori says. "If you come in for jazz brunch, for lunch, for dinner, for pub night — those are four different experiences." Hopefully guests get to experience the springy and animated Sheila Wales as their server, who has been with Stonecat since 2001, and knows just what they need to feel at home. Everything about the dish in front of the guest has a local touch. Even the name stonecat comes from the name of the catfish that live under the stones in Seneca Lake. Signori purchases whole, local, and antibiotic- and hormone-free animals from Ground Up Farms. The meat is then broken down at Autumn's Harvest Farm in Romulus. With all of the local focus, Signori estimates that Stonecat annually puts approximately $800,000 back into the local economy. For those visiting Seneca Lake this fall, save the date for the Stonecat closing party held on the Sunday before Thanksgiving. Signori describes the party as "a rager," and says there will be three bands and a buffet that features the maple-juniper sausage, made in house. "That's where the Stonecat sausage corndog was born," Signori says, referring to the now regular lunch item.